Do you participate in outdoor activities such as camping or sports? Are you tired of lugging enormous bottles to events, as well as the work of returning them to the vendor? Don’t worry – Aussie Natural Bag of Spring Water provides a portable dispensing option designed to remove the hassle from on-the-go hydration. Easy to spike bags include taps to allow for quick water distribution and are designed for easy storage and portability. 12L, these bags are designed to lay flat for easy transport and storage. 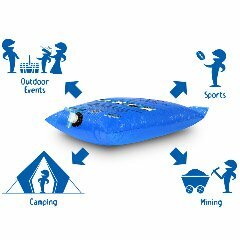 Plus, they are fully recyclable and degradable, so they are ideal for camping and outdoor recreation. Worried about BPA? You don’t have to with our Bag of Spring Water. Our office water cooler bags and portable options are made from 100% BPA-free plastic and offer a safe, sanitary storage option for your on-the-go drinking supply. Stop letting bulky bottles weigh you down. Stay hydrated on-the-go with the ease and convenience of our portable Aussie Natural Bag of Spring Water option.